This hot summer weather is calling for lots of quick to prepare light meals, thus lots of salads and refreshing desserts. 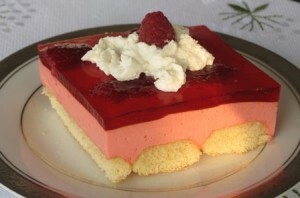 Jello desserts are one of my favorite desserts for the summer, because they are light, and served cold. My raspberries produced abundantly this year, so they were my fruit of choice for this dessert. I found this recipe on another site, posted in Polish. I translated it, and tested it last weekend on my family. Everyone really loved it, so I had to share it with all of you, my loyal readers. Line bottom of a glass casserole dish (9 x13) with parchment paper. 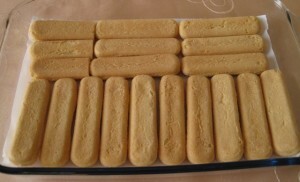 Layer the Lady Fingers cookies to cover the whole bottom of the dish, as shown above, or in your own way. You may need to trim them to fit snugly, to cover the bottom. Prepare the whipped cream, by using a cold mixing bowl, pouring in the whipping cream, and using a mixer, whipping it to stiff peaks. Do not over whip, so you don’t end up with butter, rather than whipped cream. Keep the whipped cream in the refrigerator, while preparing the jello. 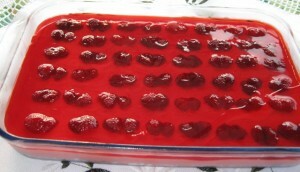 Prepare Cherry Jello, dissolving it in only 1 cup of boiling water, but not adding any cold water. To speed up the cooling process, pour it in a cold container, place it in a bowl of ice water, and keep on stirring until room temperature, or cooler, but not jelling yet. Slowly add the cooled jello to the whipped cream. 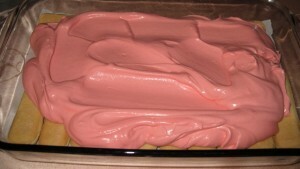 Fold the jello nicely into the whipped cream, do not mix too much, so you do not break up the whipped cream. Scoop the Cherry Whipped topping over Lady Fingers, and spread evenly, making sure it is well packed near the edges of your casserole dish, so the jello in the next step does not leak down the sides, and moisten the cookie base. Position the fresh fruit over the whipped cream layer. I butterflied my raspberries so they do not stick out too high. 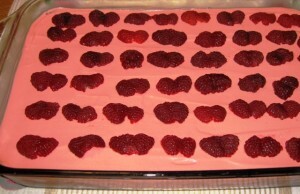 Prepare the raspberry jello, also using only 1 cup of water, so it will stay firmer and not soften as quickly during serving. 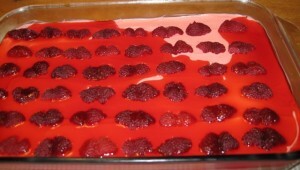 Slowly pour cooled raspberry jello over the fruit (I used small gravy ladle), until completely covered. As you can see some of my fruit still was poking out of the jello layer, but that is fine, since you do have a thin layer of jello poured over it. Cover with plastic wrap, refrigerate for a couple of hours, or overnight, and enjoy this refreshing dessert. Line the bottom of a glass 9 x 13 casserole dish with parchment paper. Layer the Lady Fingers cookies to cover the whole bottom of the dish. You may need to trim them to fit snugly, to cover the bottom. 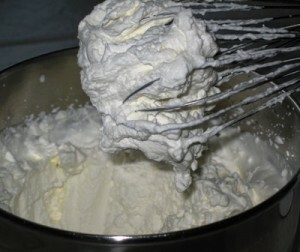 Pour the cool whipping cream into a mixing bowl and mix until nicely whipped. Do not overwork it, as it will turn into butter. Refrigerate for now. 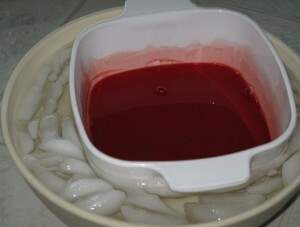 Boil 1 cup of water, and dissolve the Cherry Jello in it, but do not add any cold water to it. You might want to place the bowl of jello in a container of ice water to cool it faster to a jelly consistency, not fully set. 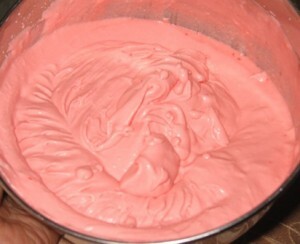 Gently fold the cooled, syruppy jello into the whipped cream, to form a nice creamy cherry mixture. 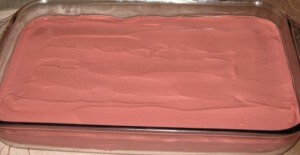 Scoop the Cherry Whipped topping over Lady Fingers, and spread it evenly, making sure not to leave any open pockets exposing the cookies underneath, so they don't get soggy from the next jello layer. Place the fresh fruit over the whipped cream layer. Add Raspberry Jello to 1 cup of boiling water, and mix until dissolved. Cool to room temperature, then gently pour it over the fruit, without disturbing it. Cover with plastic wrap, refrigerate for a couple of hours, or overnight, before serving. You can use any fruit of your choice, however kiwi and pineapple will not hold well in the jello layer. Next time I would like to try Lemon Jello with the whipped cream, and mandarin slices for the fruit, covered with Orange Jello. Yum...that sounds wonderful already...eh? Lady Fingers cookies can be a little expensive (I paid $3.99 for a box), so to cut down on cost, you may use sponge cake for the bottom layer. Thank you so very much, this is what I was looking for. thank you, this is what I was looking for!!!!!!!!!!!!!!!!!!! Vlodia thank you for this recipe .I love it .Very nice presentation and it is very good!!! That is wonderful. I’m glad I was able to help you out, and I am convinced you will love this recipe. Thank you for stopping by and finding what you were looking for. Thank you Jola. Have fun making it for your family. 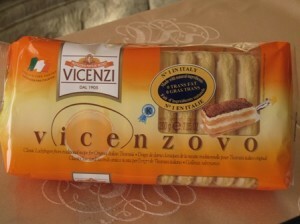 Yummy…just perfect recipe for this summer. Thanks a lot, Me and my wife will try it at home. This was my first time making and tasting it, and it really was simple to make and very yummy. Thank you for visiting my blog, and taking the time to leave comments. Could you substitute Cool Whip instead of whipped cream? I am not sure…since Cool Whip breaks down faster than whipped cream….so don’t know if it would stay whipped once mixed with the jello. If you will try it, please share your experience with all of us. Thank you.